The wind didn’t let up all night or all day. AND our anchor alarm went off about 4:00 am. The Drag Queen app gives you the option to set the distance the boat will move before the alarm sounds. And you can choose how long it has to be at that distance before it will sound. Dave had set it for 10 feet and 45 seconds. Once it went off, Dave watched it for awhile. We weren’t moving any further. 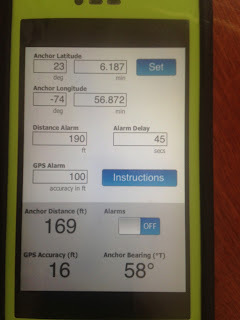 So he thinks a strong wind straitened our anchor chain, but didn’t move the anchor itself. Luckily, we were able to go back to sleep. Dave often sleeps with ear plugs. So I tried it in the middle of the night (before the alarm went off). The motion wasn’t as bad as the noise from the wind. So the ear plugs really helped. Today, I made bread and Dave made FISH HEAD SOUP. He had heard about it from Chinese friends. In the Bahamas, he heard that the locals won’t buy a fish unless it has the head on it. And he has seen it on menus. So of course we had to try it with two heads from the last 2 mahi that we caught. He researched recipes on line and used a mix of Bahamian and Chinese recipes. He is calling his style CRUISINE. Making due with what we have on the boat. It actually was better than I thought it would be. I tried one of the eyeballs, but was a devoted wife and gave Dave the other one. The gills had thousands of tiny bones in them. So I got out of trying those. 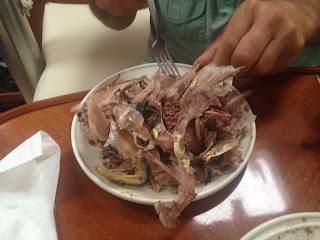 The meat in the forehead, cheeks and jaws were actually quite good. 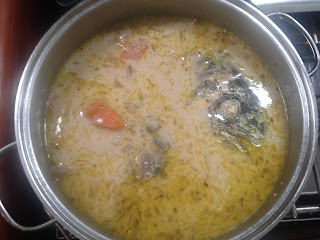 The broth was made from chicken bouillon and coconut milk at the end. He added garlic, onion, potatoes and squash and spices including cinnamon and allspice. 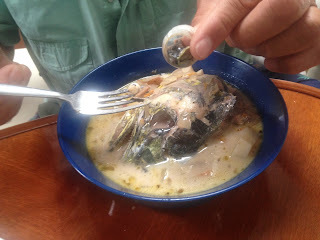 There was also a story that inspired him to make fish head soup. We met Civian in Black Point, Exumas about a month ago. She is from the Bahamas, but has lived in the US for about 30 years. She married someone from the states. One of the first meals she made for her husband was fish head soup, a common dish she made back home. When he was stirring the pot on the stove, he saw the fish heads. She said he backed away from the stove saying things like “what’s that? I’m not eating that! 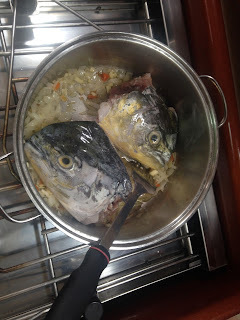 No wife of mine will cook with fish heads!” I guess that was a turning point in their early marriage, because she told him he had to eat it or go hungry. 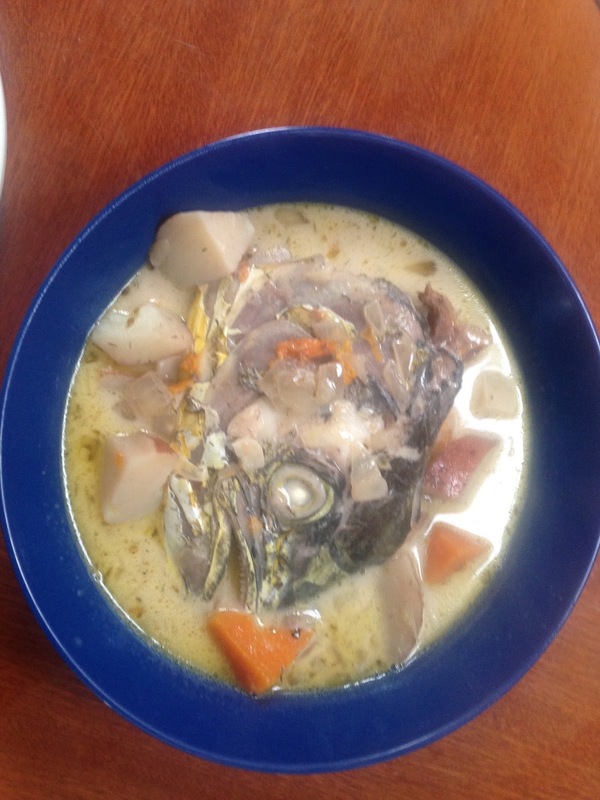 Dave can just see her fish head soup at a Vikings tail gate party.